In 15 years, the annual number of people newly infected by HIV has dropped from 3.1 million to 2.1 million. Today adolescent girls and young women are at disproportionate risk of acquiring HIV especially in eastern and southern Africa. In 2014, 350 000 adolescents girls and young women aged 10 – 24 years became newly infected with HIV globally, the vast majority of whom live in southern Africa. Reasons for the higher HIV risk are living in challenging environments with insufficient access to food, education and housing and high rates of violence. Sexually active young women are particularly vulnerable as they often engage in sexual relationships with older men in exchange of food or money – the so called “Sugar Daddy Syndrome”. Young people perceive the risk of acquiring HIV infection as low, their use of condoms is insufficient and they get less often tested for HIV. For those adolescents living with HIV treatment adherence is often low and treatment failure high. According to statistics only three in ten adolescents’ girls and young women 15 to 24 years old have comprehensive and correct knowledge of HIV. Given the high transmission rate of HIV and the aim of ending the epidemic by 2030, HIV prevention programs aiming at halting the transmission are more important than ever. The ‘know your epidemic, know your response’ approach is the starting point for combination prevention programming, combination prevention relies on evidence-based strategies which include behavioral, biomedical and structural prevention strategies (s. figure). These strategies operate on different levels such as the individual, relationship, community and society level. Although combination prevention is not a new idea, it is striking how seldom it has been systematically implemented. 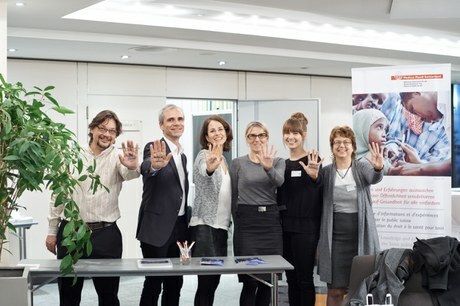 Medicus Mundi Switzerland / aidsfocus.ch raised their #HandsUp for #HIVprevention together with its partner organizations: Swiss Red Cross, COMUNDO, Handicap International, Terres des Homme Schweiz, Swiss TPH, FAIRMED, World Vision Switzerland, Schweizer Partnerschaft Hôpital Albert Schweizer Haiti, Women’s Hope International and SUPPORT. We put up our #HandsUp for #HIVprevention & we call for more respect for the #rights of people living with HIV so that we can #EndAIDS.